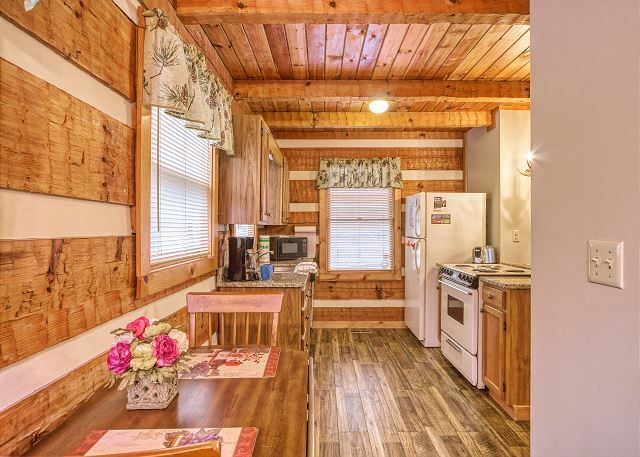 Rainbow Ridge 4 Seasons near Dollywood is a fabulous Pigeon Forge cabin rental for romantic honeymoons or family vacations. 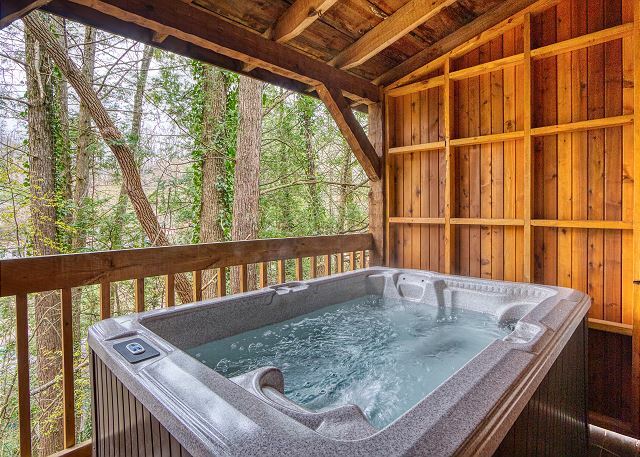 This log home has an amazing... VIEW NOW. Cute cabin. Was just what we needed. Exactly as described! Hit all our necessities: dog friendly, in budget and available for the holidays. Also very happy with the close location to downtown, the view and privacy. 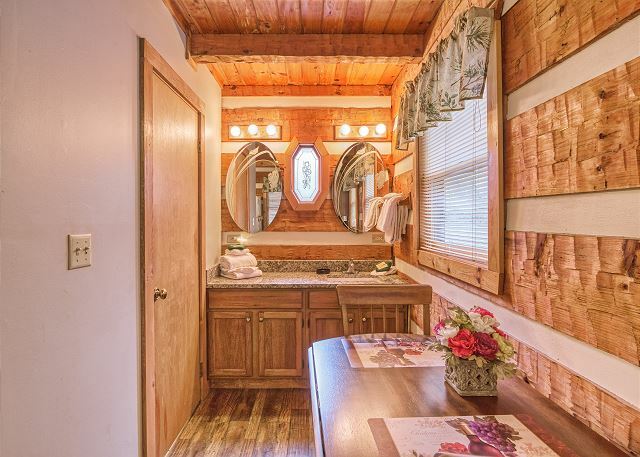 You literally get tour own private cabin with hot tub, kitchen, and fire place for less than a small cheap hotel in town. Cabin was easy to get to, staff was dry friendly and even called to check on us. We did have an issue with the tub, but the after hour maintenance was out to us right away and the problem was fixed quickly. I would stay again and recommend. It’s not fancy or modern (appliances are very dated), but it is a great deal for the low price. My only complaint would be that the jacuzzi tub runs out of hot water, so no relaxing soak by the fireplace. We had a great experience. The cabin was just right for the 2 of us. It had everything that we needed. Pretty clean except a giant cobweb on one of the wooden beams. Blinds and windowsills pretty dusty. We would stay there again. We rent cabins here times a year always try different one. This one was nice close to town. But over all Great little cabin!!! The cabin was very clean and was even nicer than the pictures make it look. The staff at check in was very friendly and quick. I would definitely recommend Aunt Bugs to a friend and will use them again. 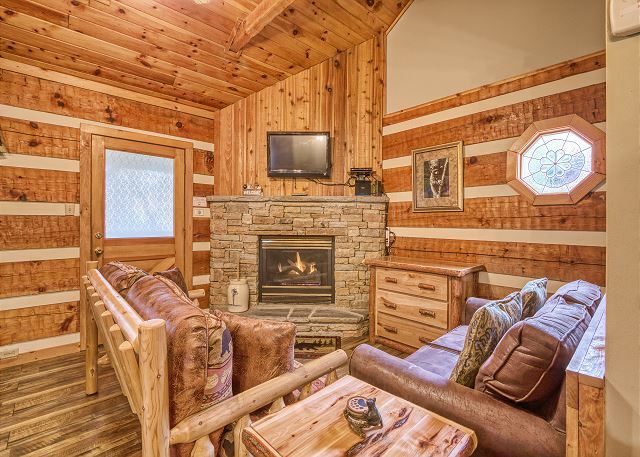 Great cabin but not within walking distance of Gatlinburg for old people like us. 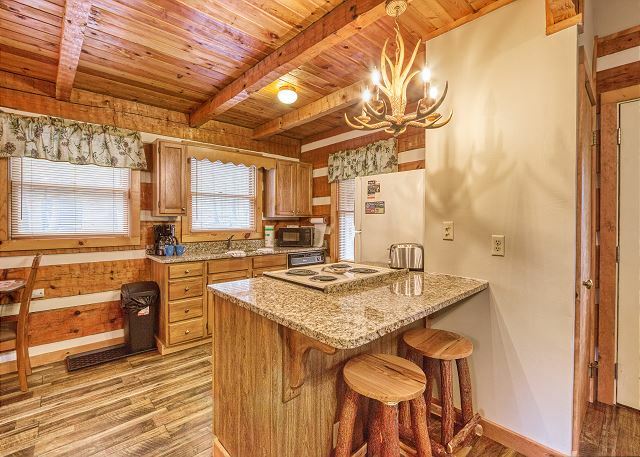 This cabin is close to walking distance to downtown Gatlinburg, There is also a trolley stop at the end of the street. It very quiet, The deck on the back is covered and both end caps are closed off so no one can see in. We took our dog with us and was able to let her out with out the fear of her running off. We had a great time at ant bugs and would stay again in the future. Thanks a lot. Nice place to stay with the one you love. WAS VERY NICE. WOULD GO BACK AGAIN. WOULD RECOMMEND ANYONE TO STAY HERE. It was Clean and neat. We loved it. The phone and wi fi are not reliable. The balcony is bit noisy because o the hot tub that I didn't know how to turn off. We had the nicest little cabin. It was much better than I expected! Updated and clean! I loved the porch and hot tub. Very clean which is the most important thing to me and my family when traveling out of town. We had a wonderful time in our cabin! It was perfect for my husband and I. It was close enough to town so that we could frequently come and go, but far enough away to be secluded. There were some bottles and trash from previous guests under the bed, but we didn’t notice it till we were leaving so it wasn’t a big deal. I would use Aunt Bug’s again and can’t wait to come back!! Thanks for a wonderful vacation. My husband and I enjoyed staying in this quiet, private cabin this weekend! 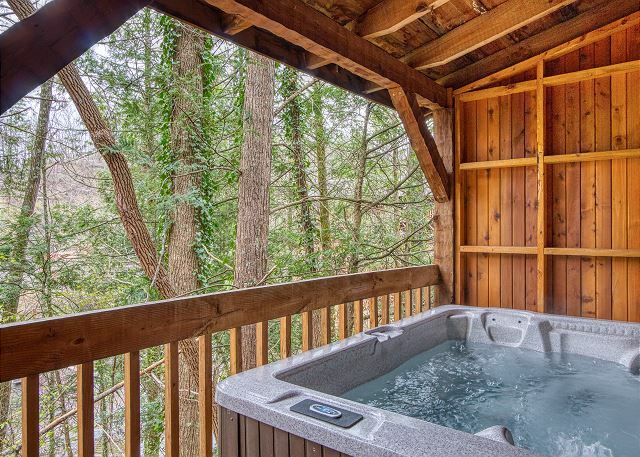 We liked that the location was close to downtown Gatlinburg but yet seemed tucked away. The staff is very friendly and assisted us with everything we needed. There were plenty of towels and supplies for us for the weekend and there were even nice, clean robes waiting for us on the bed when we arrived! Overall the cabin was clean and comfortable for my husband and I over the weekend. There were a couple of things that could have been better. We noticed about 4 bugs in the cabin during the weekend (2 spiders, an ant and a moth) and one of the rocking chairs on the back porch appeared to be broken so we couldn’t use it. We told the office about the rocking chair and they said they would fix it so hopefully the next guests will be able to use both:) Also, although the jacuzzi had a cleaning filter in it, the water appeared a little dirty and could potentially use some clean water. We still enjoyed our stay and wouldn’t discourage others from staying in this cozy little cabin! 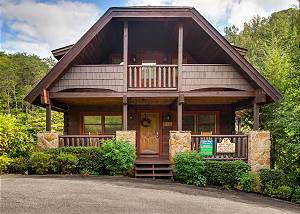 Great location just at the entrance to Gatlinburg; convenient to Pigeon Forge also. Very comfortable, could use some updates but very clean. Nice jacuzzi on the deck. Highly recommend! Had a great experience, cabin was everything and more than what was expected. I will no doubt be planning again in the future. We were a last min book and we went in expecting the worst compared to other prices in the area. We were blown away!! Great price and gray staff and awesome cabin! Very homey and so nice to not stay in a hotel! Loved it and will definatly be staying againof we come to tn again! WE REALLY ENJOYED OUR STAY & PLAN ON COMING BACK FOR OUR 1 YEAR ANNIVERSARY . This was a nice place to stay. The appliances was outdated but they worked. I would stay here again. My weekend getaway with my girlfriend was a complete success! We enjoyed the scenery and attractions of the Gatlinburg area with exceptional help from our stay at our Aunt Bugs Leather and Lace cabin. I would strongly recommend this cabin and/or rental agency to anyone if you want to enjoy a comfortable nights rest and peaceful relaxation days for your vacation. We had a wonderful time! Cabin is not very walkable to Gatlinburg. Roads are steep. Not a problem. We found plenty of parking. Plenty of things to do and explore. Coming back soon. We enjoyed this cabin very much! It was exceptionally clean & the hot tub was great & very private. We would definitely recommend this cabin & also would love to stay there again. We just drove up last minute with out anywhere to stay. We called them and they had an opening and put us in this great little cabin. It is only a min. or two off the main road, but still secluded. Thor place was very nice. Cabin was ideal for a couple. 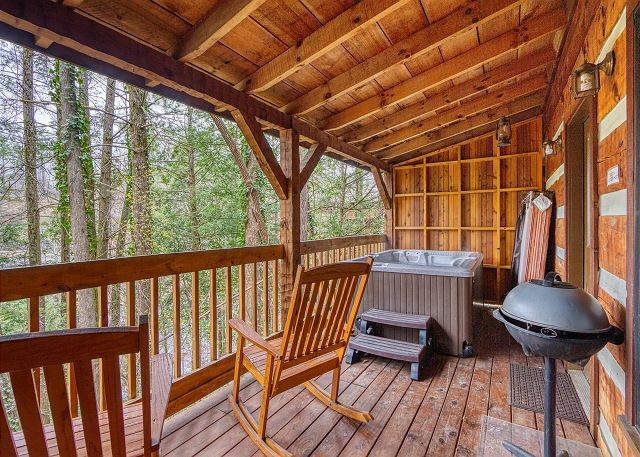 It had a good degree of privacy and was close enough to walk to most things in Gatlinburg if you are in fair health. The amenities in the cabin were much better than described. Hopefully we will be able to repeat our stay n the future. it was our 12 year anniversary get away. it was a very nice trip to TN in Gatlinburg. the cabin was a nice one room cozy cabin. Wish we could've stayed longer. Very Pleasant. Kinda small but just fine for two people. We had a wonderful time and very clean and staff was very nice!?? The cabin was delightful and the staff was very helpful. It was exactly as portrayed online. It hit all of our must need boxes: dog friendly, affordable, and available for the holidays. 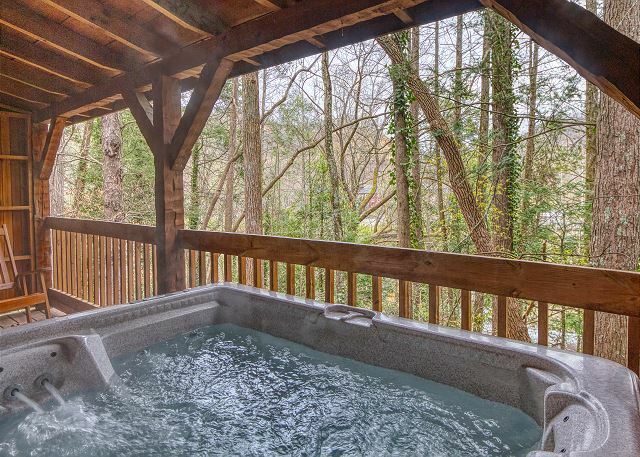 It also hit all my wish list wants like: close proximity to downtown, hot tub on balacony, and a view. Extremely happy. Only negative was that the jacuzzi tub doesn’t get hot and the shower has a bench under the head, so I was ramming my knees on it the entire time and the thin shower curtain doesn’t do much to prevent the floor from getting drenched. I only mention because those are small things that can easily be updated or fixed but didn’t really effect our overall stay. We would love to stay again and recommend to friends. Cabin was exactly as described and just as lovely in person. Check in/out was a breeze. Thanks! The cabin was very nice but the view could have been better. Very nice and peaceful stay. The cabin was was very pleasant. The service was quick and friendly. The cabin was beautiful and very clean. The pictures online do not do it justice. I will definitely use Aunt Bugs rentals again. The stay was amazing the cabin was extremely clean and cozy just the getaway I was looking for! Very through and intentional about ensuring guest know all details and expectations; excellent customer service. The Cabin was in a great location. Nice and cozy, outside hot tub was provided and overall a great little cabin. The cabin was very cozy. We had everything we needed. Overall a wonderful experience. Only complaint would be very few wash clothes for a week stay with no washer and dryer. Jacuzzi tub stopper was poor and wouldn't work properly. This was our honeymoon and we loved the location and cleanliness. Very friendly staff and was exactly what I expected. Very beautiful cabin..
We were totally satisfied with the cabin we stayed in. In was very cozy. Thank you. I had not noticed that there was a weight limit on the size of dog one could bring. Our's was almost twice the limit, but you were willing to let us keep her with us in the cabin anyway. That was great. Thanks. You were very polite, answered all my computer questions very well, the cabin was clean and neat. We really enjoyed our stay. The only thing was roaches in the kitchen. Other than that, everything was fantastic. Very informative staff and pleasant to work with. I would highly recommend staying here. The view from leather and lace cabin was breath taking along with it only being in minutes away from the town was amazing! Did fine. Wish our stay hadn't been cut short due to fire. Very scary for us. Loved the quaint cabin. Terrific place to stay for our weekend get-away. Planning on returning again next year. Very friendly service. Would stay there again for sure. The location was really good to everything. Very nice on getting us sign up and off to our cabin! Love everything about my stay. I will be back soon hopefully for longer. It was great , perfect . The cabin Leather and Lace was clean and in a great location. Easy check in and check out . And the price , excellent . We couldn't ask for more. This was my first time renting a cabin. I loved it. The cabin was perfect. We enjoyed our stay with you all. The cabin was neat & very clean & cozy. Other than not informing us that your office closed at 6PM on Sunday, we barely made it, and that we could not get WI-FI the experience was excellent. We enjoyed our time at the cabin, which was very clean and was everything promised. We loved the privacy of the cabin yet it was close to all the major attractions. The cabin was very clean and well stocked. We loved every minute of our stay! Great communication and clarity for all portions of my stay, very nice property, and excellent service. The experience was just beautiful the place was nice clean and cozy loved the reasonableness of the price. I'm definitely coming back! We were very happy wil the cabin. We look forward to visiting again. Excellent stay. 4 cabins and all were great. 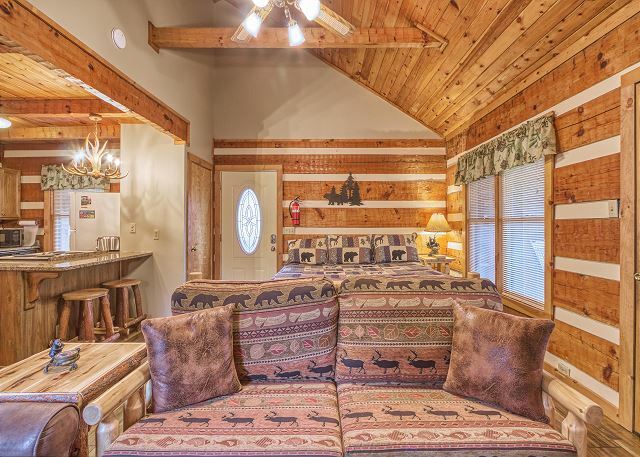 No complaints on any cabin. I really enjoyed your cabin. Very clean and we'll maintained. We will be back to visit again. Cabin was clean and comfortable. Even had a bear come visit us while we were there! The rep I spoke with recommended the perfect place, had my reservations set up very quickly, and sent me the information for late checkin right away. It was an easy experience!